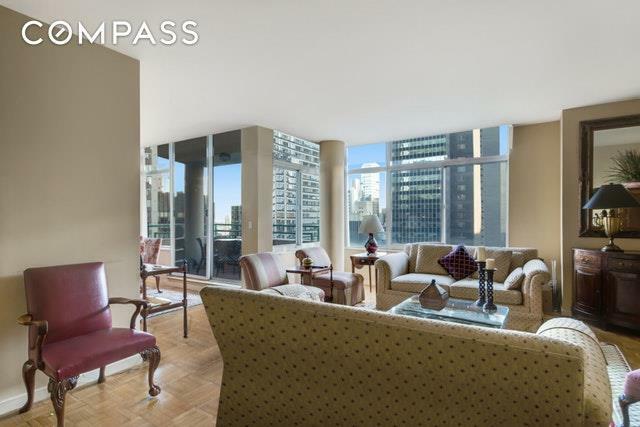 Enjoy breathtaking views of Manhattans skyline from every window of this two-bedroom, two-bath at The Cosmopolitan Condominium, Midtown Easts premier full-service doorman building with garage. This high floor home features a desirable split-bedroom floor plan, gorgeous southern and eastern exposures, two terraces, and central air conditioning. Upon arrival, you are welcomed into the gracious living room with ample space for both entertaining and dinner parties. Delight your guests as you dine al fresco on the corner terrace, surrounded by sweeping city views. 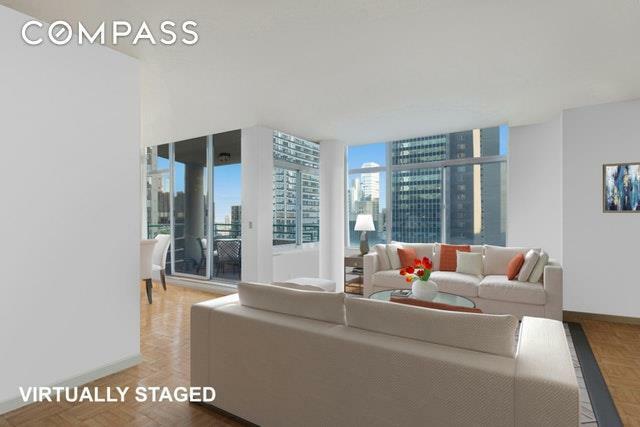 (Please note: living room and terrace photos are virtually staged.) The spacious master bedroom features southern exposure, a private balcony with stunning views of the Chrysler Building, an en-suite marble bathroom with a separate stall shower and bathtub, and two large closets. The comfortable second bedroom, with eastern exposure and lovely morning light, can easily fit a queen sized bed, and has an adjacent bathroom. The windowed full-sized galley kitchen offers granite countertops, generous cabinets, a pantry closet, GE Profile and Kitchen Aid appliances, and a Sub-Zero refrigerator. Built in 1985, this pet-friendly full-service condo is an ideal primary residence, pied--terre, or investment property. 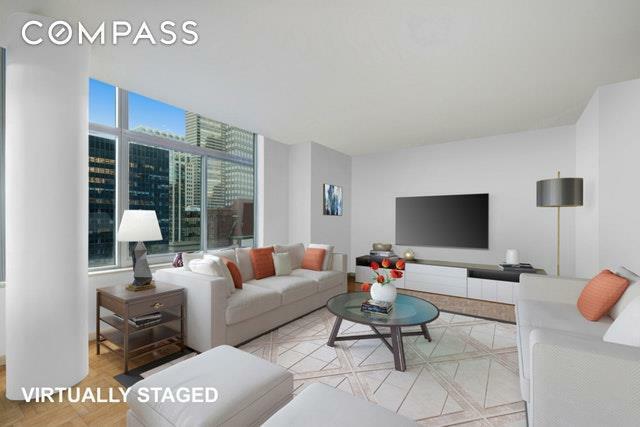 First class amenities and services at the Cosmopolitan include 24-hour doorman, concierge, rooftop terrace, live-in super, central laundry room, private conference room, and an on-site garage. Located only a few short blocks from Grand Central Station, Fifth Avenue, Rockefeller Center, Broadway and the best shopping, dining, and most convenient transportation in Manhattan. 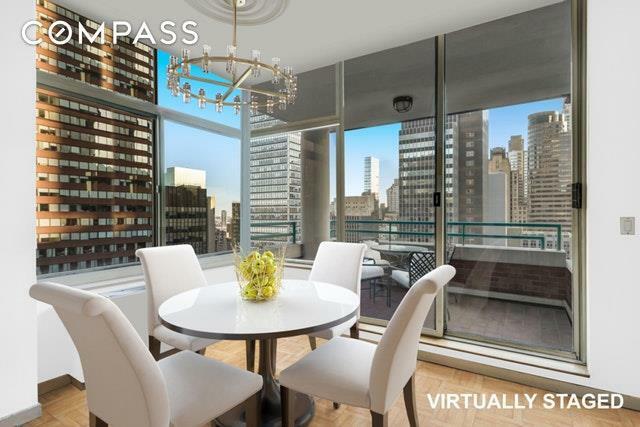 The Cosmopolitan Condominium is where luxury living is made easy. There is an assessment of $96.36 /mo for a limited time. Listing courtesy of Janet Brenner of Compass.